One of the most often asked questions: “Which iPad should I choose?” Spoiler alert: Get the Verizon model, as much memory as you can afford. Why the Verizon iPad? Wireless Presentation. There are three ‘flavors’ for the latest iPad. First, wireless only which means no internet access unless you are connected to a wireless network. For some people, they don’t care about needing to piggyback on strange and unfamiliar wireless networks. If you fear the seedy back alleys of free wireless, go with an iPad that has built in cellular technology from either Verizon or AT&T (sorry, not available on Sprint at this time). More specifically, go with the Verizon version. Why? (1) Tethering. 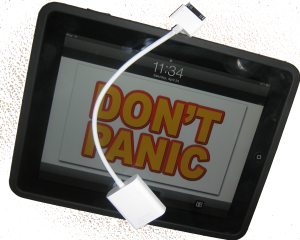 (2) You can tether the AppleTV to your iPad and, yes, that means you can now carry one less device for wireless presentations in court (or elsewhere). With an AppleTV tethered to your iPad, you can also use AirPlay to stream back to an AppleTV connected to a projector. Finally, get as much memory as you can afford. Although cloud storage is becoming ubiquitous, it’s still nice to have as much headroom as you can get. When Steve Jobs announced the iPad he called it ‘magical.’ Magical seemed a bit silly and somewhat corny. Over the past year and a half or so, the iPad offered more and more to the point that it has truly become magical. 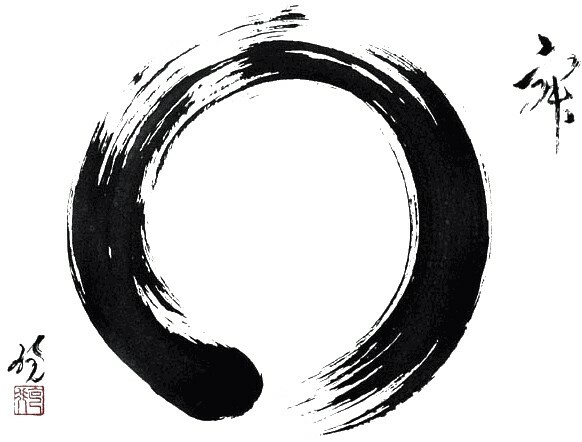 And that, perhaps, was the genius of Jobs… the ability to see the magic of the future, today. The recent update to iOS 5 combined with an Apple TV (ATV) software update confirms the iPad as a serious piece of technology easily accessible to everyday folks, and even lawyers. You can now, from a chunk of aluminum and glass smaller in size than a legal pad, wirelessly display across the room virtually anything that can be shown on your iPad. Need to show a street scene? Stream Google Earth, wirelessly, straight to a projector, pinch to zoom, swipe to tilt. Need to show detailed anatomy? Fire up Netter’s Atlas and present beautifully detailed anatomical drawings with pinch to zoom. Want a 3D anatomy? Do that too with Visible Body, a really great anatomy app that lacks the fine detail of Netters, but wows with 3D zooming, pan and tilt on all anatomical structures. Need to mark up a PDF or photograph? Yeah, you can do that too, live, in front of the jury. GoodReader, ReaddleDocs and PDF Expert all stream a beautiful mirrored copy of your markups. 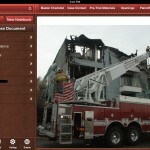 Need to show a witness interview or video of the scene? Check. Wirelessly. Want present without simultaneously mirroring your actions to the display? At least three apps recognize the ATV as a separate display and retain the iPad display for the user to manipulate the projected image. 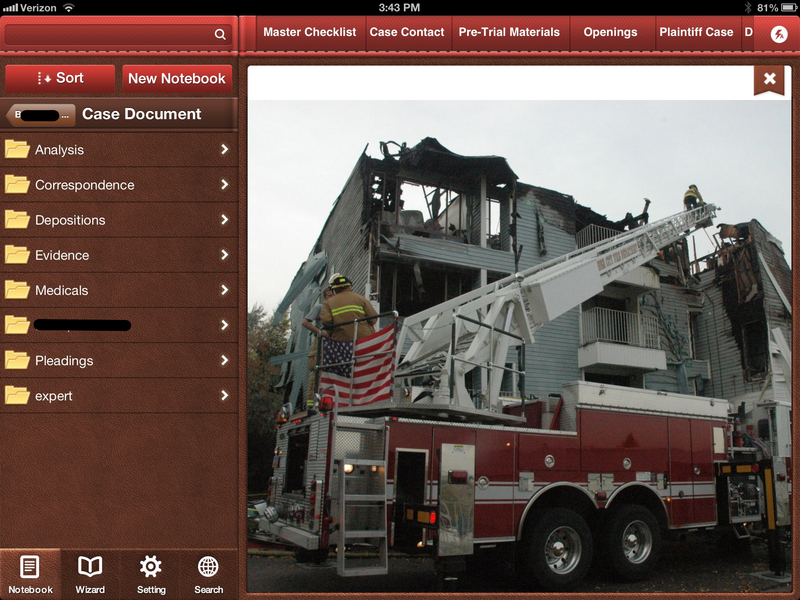 TrialPad smartly and critically shows only the particular exhibit, treating the ATV as a secondary display and leaving the iPad screen available for markup and annotation hidden until ready to display. Apple’s Keynote presentation program also uses the ATV as a ‘secondary’ display, again leaving the iPad to function as a presenter only screen where you can view individual slides, highlight the slide on display with a laser pointer, or read your presenter notes. 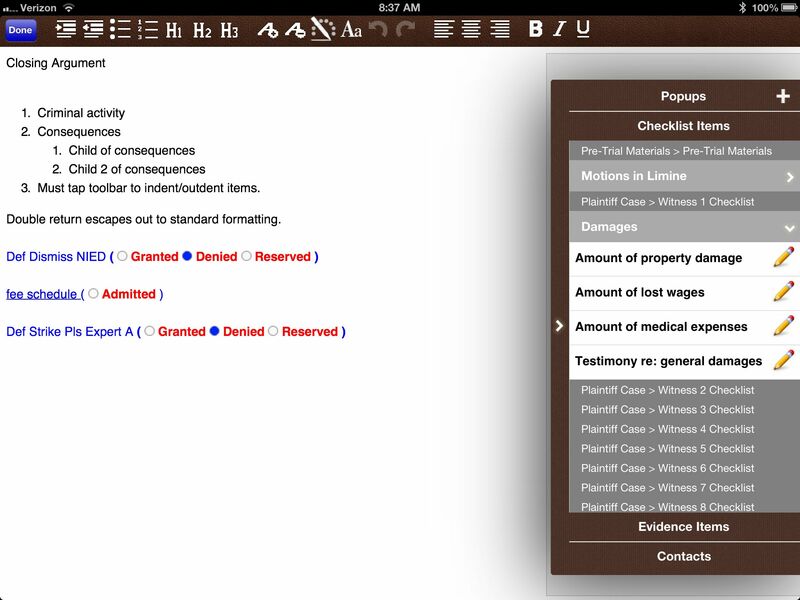 iAnnotate can simultaneously show an exhibit on the projector via ATV, while allowing you to reference your examination outline on the iPad itself. Really, really useful stuff and all from two little tiny pieces of technology that seem so innocuous: a slab of aluminum and glass and a small black cube. Magical. The Apple TV uses an HDMI out cable, so your projector will need to be capable of accepting HDMI input (many projectors only accept VGA). Once you have your Apple TV up and running, with the latest software installed, you need to make sure that both the ATV and the iPad are running on the same network. This is the only ‘techy’ part of the whole project and there are three options: First, use whatever wireless network you can find in the vicinity and hope that it is stable and fast enough to support you. Not a very good option, IMHO. Second, and cheapest, pick up an Airport Express and use it to set up a local wireless network. An Airport Express will only set you back about $99 if you pay full retail and can often be found on discount at sites like Other World Computing for as cheap as $59. Third, but not least, set up your MacBook as an ‘ad hoc’ wireless network. Then, connect your iPad and ATV to the MacBook’s ad hoc wireless network. Once this is all set up, from the home screen double tap the home button or four finger swipe upwards. Then, swipe the active apps tray in the bottom of the screen to the right. 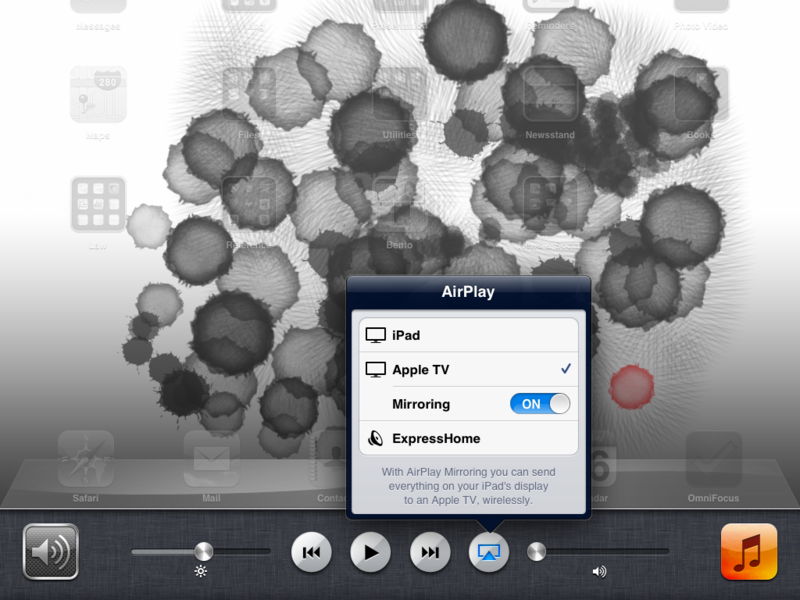 Now, you should see the AirPlay icon. Tap it and select your ATV and turn mirroring on. Wash, rinse, repeat. Back in the dark ages (prior to the widespread availability of the ‘personal’ computer), my father worked in a corporate environment. There was always a push for the most up-to-date technology as a tool which could speed work, improve accuracy and even take out the garbage if you were willing to just spend the time writing code. Unfortunately, due to limitations of hardware at the time, that kind of coding eventually only produced a program that would flash “take out the garbage”on the screen at a given time and day. One particularly impressive piece of technology available to staff: a “presentation” device. This device consisted of a series of rackmounted slide projectors which could be operated so as to give the effect of “transitions” between slides. This amazing slide projector had cutting edge features such as a 1300 lm lamp; forward and reverse control of slides; an RS-232 serial connector; random slide access via remote control or computer; a built-in dissolve feature (0 to 10 seconds); and it weighed in at a feathery light 26 pounds. All this for a paltry $1,560 (lens not included). Surprisingly, the manufacturer did not include the most important feature in the press release materials: an amazing capacity to consistently overheat and crap out 5 min. into a 20 min. presentation. The more things change, the more they stay the same. Recently, in the middle of trial, about to begin a cross exam of a witness, the TrialPad app, when reconnected to the cable at the podium, refused to display anything other than mirror mode. The revolutionary software, this secret weapon, this huge advantage over my worthy but technologically handicapped adversary, was now not only worthless, but also a potential scuttling of my whole boat. 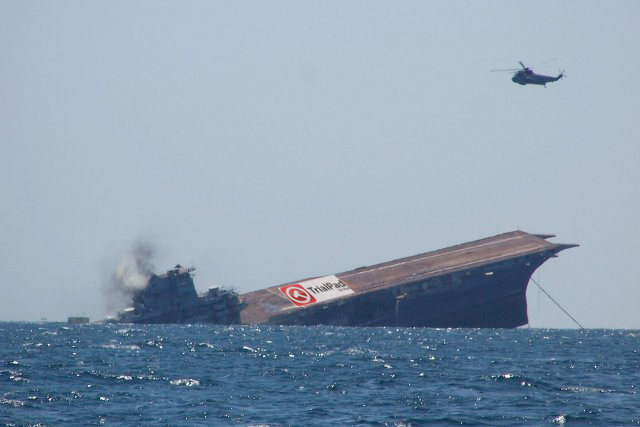 Technology rigorously follows Murphy’s law: anything that can go wrong will go wrong. Plan ‘B.’ The cross exam depended on a few key documents and prior testimony. Time to go old school. At every trial, the important exhibits (there should usually only be five and absolutely no more than ten of these) should be blown up and placed on foam board. Now, here’s the trick: get those blow ups laminated. This allows you to draw, write and highlight directly on the blow up with dry erase markers which can then be later erased. Next, always have a hardcopy of your exam outlines contained in your trial notebook. Last, always have hardcopies of the depositions. With these items in hand, you never need to worry that technology will fail you. You only need to question whether the time and money involved in technology are worth the the effort. 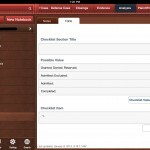 Note: The fatal bug in TrialPad appeared in a previous version and has since been corrected. Maclitigator just completed a four day jury trial (a.k.a. “in the Soup” as my friend Chuck might say) using the iPad as the primary means of getting information in front of the jury. Here’s the low down on how it went. 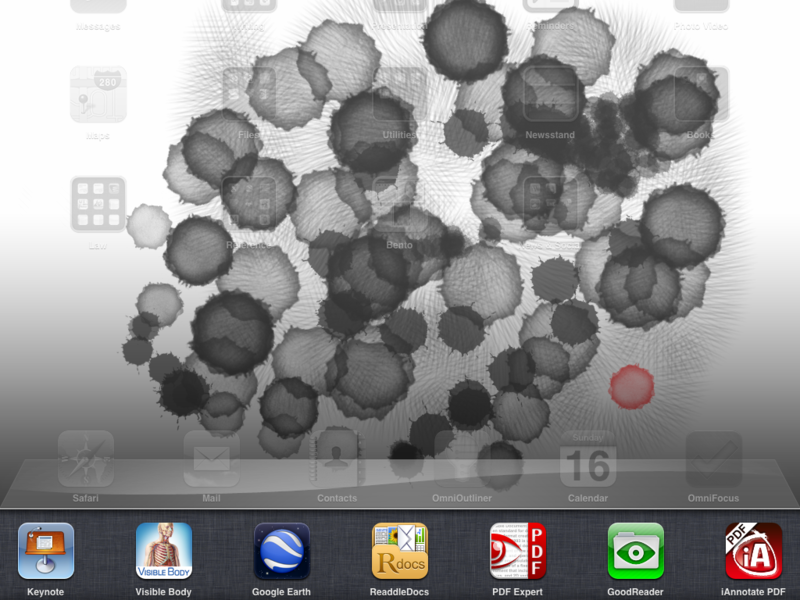 The last post on the iPad indicated that it isn’t (yet) of too much use in the day to day affairs of a trial attorney. However, at trial, the iPad really shines. Trial technology should be transparent. This means that it should not appear to the jury as (1) overly flashy; or, (2) a complete headache and a distraction to the attorney. Apple has created a product which facilitates presentation of evidence without getting in the way and does so in a completely unassuming fashion. 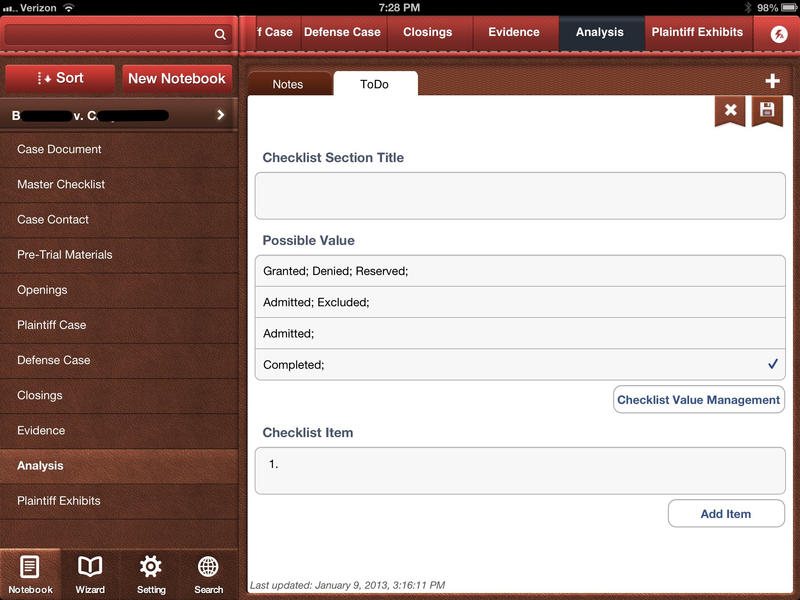 The iPad sits low and is the perfect size to place next to a legal pad or other notes while at the podium. Using Keynote, all documents to be admitted at trial were loaded in. Blank slides provided a ‘tabbed’ divider set up, separating photos of the scene, x-rays, medical records, tables & summaries into their respective categories. Once the “Trial Slides” were completed, examination outlines cross referenced the appropriate slide. The slides were not ‘motion slides’ or slide incorporating transitions or other fancy Keynote stuff. Just a single page per picture/document. Photos were grouped as a single exhibit (e.g. Exhibit 5 was a series of 5 photos, or 5 slides in Keynote). The slides were then printed out and placed in an indexed binder which referenced the Exhibit number, the slide number, and the tab within the three ring binder. In this fashion, slides could be pulled up quickly and all evidence to be admitted was contained in a single Keynote presentation. All deposition transcripts were transferred to Keynote as separate presentations, using PDFtoKeynote, a great little application that will take a multi-page PDF and turn it into a Keynote presentation, one page per slide. Because the iPad can switch so quickly between presentations, flipping from the Trial Slides to the deposition transcript slides during a cross examination is an effortless process. Jumping back and forth between evidentiary exhibits and impeachment transcript evidence works like a charm and is much more smooth than wandering around the courtroom looking for the paper documents. PDFtoKeynote also works great for moving over multipage medical records too. Hardware setup could not be simpler. (2) a high quality and long VGA cable. Don’t try your local Shack or Bust Buy, they’ll either sell you an overpriced “Monster” cable or tell you that you can’t run long VGA cables because the signal fails. We ran a 25′ thin VGA cable from the projector to the podium with no loss of signal and at a cost of about $25. Our cable came from VPI and was good quality. (5) the silicon inCase for iPad (get the black one, obviously). The iPad itself is a bit slippery. Sweaty palms and all during trial, the inCase silicon provided a great grippy feel and prevented the hard ‘bang’ sound of aluminum on wood at the podium. One downside of the case is that the iPad VGA video adapter would not fit through the opening. This required pulling the case slightly down to plug in the video. Only twice did a technology hiccup occur during use at trial. On opening a presentation for the first time, Keynote abruptly quit, resulting and returned to the iPad home screen. Tapping Keynote and reopening the presentation quickly cured the problem. It’s a weird little bug that will probably be remedied and can be avoided by opening the presentation in advance. But, even with the ‘crash’ of Keynote, two taps and the thing was back up and FAST. The first time it happened there’s that momentary panic, but it opened up so quickly that the second time it happened I didn’t even notice it. The MacBook came along at trial, but sat somewhat despondent at counsel’s table. Never once was it taken to the podium. It did come in handy for a quick search, during opposing counsel’s direct exam, for cross exam references in the witness’s deposition. 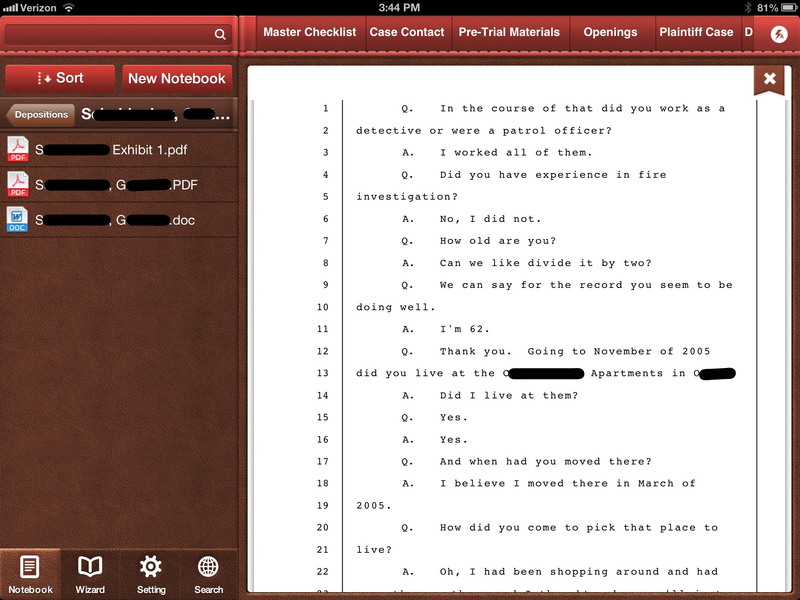 But, iPad then took over by pulling up the transcript for the jury to see. More about the trial itself can be read here. Present Like Steve Jobs, Without the Black Turtleneck. Sell the benefit. While most presenters promote product features, Jobs sells benefits. When introducing iTunes movie rentals, Jobs said, “We think there is a better way to deliver movie content to our customers.” Jobs explained the benefit by saying, “We’ve never offered a rental model in music because people want to own their music. You listen to your favorite song thousands of times in your life. But most of us watch movies once, maybe a few times. And renting is a great way to do it. It’s less expensive, doesn’t take up space on our hard drive…” Your listeners are always asking themselves, “What’s in it for me?” Answer the question. Don’t make them guess. Clearly state the benefit of every service, feature, or product. 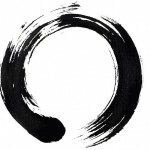 Jurors present the very most difficult audience, they usually don’t want to be there, start with the belief that everything you do is a lie geared to influence the outcome, hate to waste time anymore than necessary and yet must be taught about very difficult legal, medical, and technical issues in the stilted classroom that we call court. Although I knew enough to embrace elimination of bullet points, irrelevant and ridiculous .gif images, superfluous and magical slide transitions etc. the ability to push things onto a big screen can even lead those who know better astray. In a soft tissue injury trial a few years ago, the complete set of medical records were scanned and available for presentation. When conducting direct examination with the treating physiatrist, each record was popped onto the screen in an attempt to show (1) consistent complaints of pain (credibility); and, (2) sticking to a treatment and physical therapy plan (mitigation). About half-way through, I glanced at the jury box. The jurors not sleeping looked alternately peeved and bored. Lesson (one I already knew, but ignored): Just because technology enables you to do something, doesn’t mean you should. Whether you are using Circus Ponies Notebook, Keynote or another piece of software, those who ignore the rules of good presentation etiquette do so at the risk of, at best, boring their audience or, at worst, fostering hostility toward you and your client. 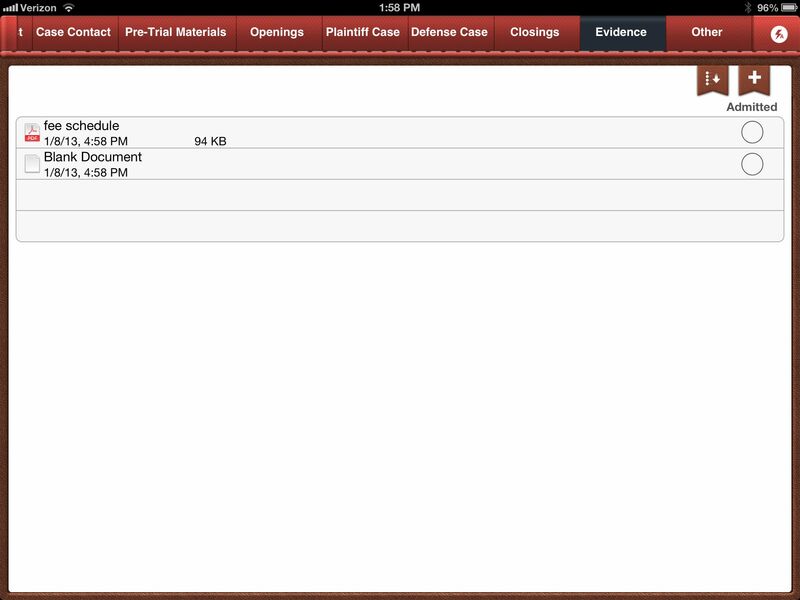 The Mac Lawyer has a guest post article by G. Ware Cornell Jr about his jury selection spread sheet using iWork ’08’s Numbers program. While it might not precisely fit your practice, just seeing the template created by Mr. Cornell provides a great jumping off point…. and the fact that Mr. Cornell created the template “in about ten minutes” should further give you the necessary inspiration. 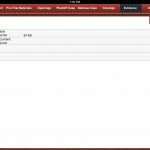 Read the post and download the spreadsheet at The Mac Lawyer.